Scroll through the photos above to see more from the event! HUNTSVILLE, Ala. (February 6, 2019) – The Huntsville/Madison County Chamber hosted its 83rd Annual Membership Meeting on Wednesday at the Von Braun Center North Hall. 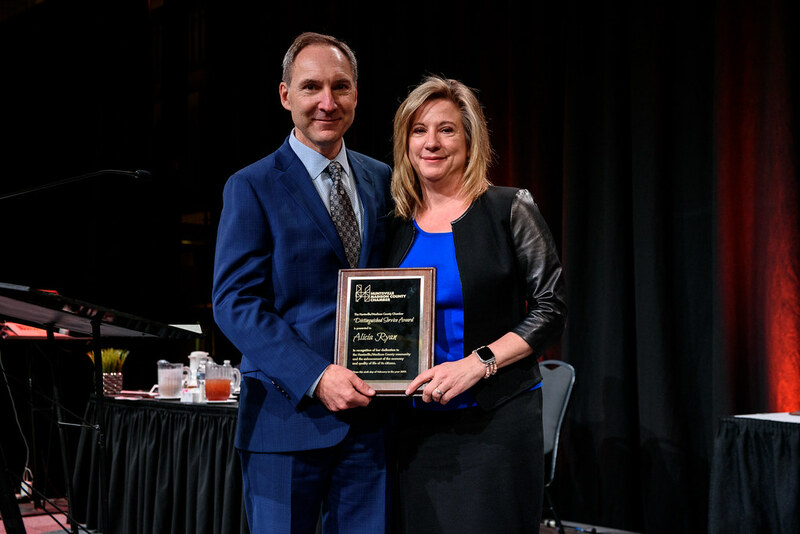 Before passing the gavel as outgoing Board Chair, Gary Bolton presented the Distinguished Service Award to Alicia Ryan. This is the highest award the Chamber presents to an individual. Alicia Ryan is the founder and CEO of LSINC, a diversified manufacturer and government contractor headquartered in Cummings Research Park. Her volunteer positions include serving as the Vice Chair of the Board of Directors for the Alabama School for Cyber Technology and Engineering, a statewide magnet school created by the Legislature in 2018. She also serves as the Chair of the Board of the Foundation supporting the school. This school will be the first of its kind in the nation and will address the growing demand for cyber and engineering professionals in the workforce. The school, which is scheduled to open in the fall of 2020, is currently involved in a national search to hire its first President. The school will accept students from the local area as well as from around the state. Planned enrollment will be 350, with approximately half of the 7th – 12th grade students living on campus. Bolton, who is Vice President of Global Marketing at ADTRAN, presented a $10,000 donation on behalf of his company to the school. Ryan accepted the donation on behalf of the Alabama School for Cyber Technology and Engineering. The Annual Membership Meeting gives us the opportunity to present updates on the past year to members and community leaders, plus look ahead to what’s in store in the coming months. Last year capped off a two and a half year period of record growth for North Alabama. The 2018 Annual Report was distributed to Annual Meeting attendees, and it is published online. Kim Lewis, the CEO of PROJECTXYZ, received the gavel as the 2019 Board Chair from Bolton as his term as 2018 Chair concluded. Lewis is the first African-American woman to serve as Chair of the Huntsville/Madison County Chamber Board of Directors.